On the beach, â€œBeauty of the Phoenixâ€ is presentedâ€”inspired by ancient legends that lead people to unlimited thoughts and interpret the legend of rebirth. The 2012 spring and summer advertising work marks the second creative cooperation between the beach and the famous photographer Chen Man, and successfully invited Lin Zhiling and Hu Bing to join. 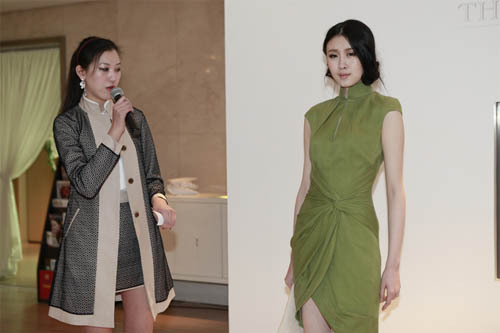 The Shanghai Beach Spring 2012 series was named after the â€œBath Phoenixâ€ and cheered for the revitalization of modern China. With Phoenix, the metaphorical significance of this bird, the "Bathfire Phoenix" describes the transformation of an ancient civilization with a long history and full of creativity - from being poor to being today's global leader. This season presents a kaleidoscope of Chinese culture that is implicated in the imagination of its huge population. It has emerged from the ashes and ushered in rebirth. The heavenly gray domain is focused on the beauty hidden in the simplicity. The vague scene, even though it is barren and depressing, has endless possibilities. The color system covers a series of subtle variations of dark, cold, and muddy organic tones, ranging from licorice black, charcoal to light green and magenta. The innovative prints have been modernized for the classics, and the Phoenix pattern has taken on the lava effect, recreating the traditional fangs pattern. The burning color suggests that the phoenix was momentary before the rebirth from the ashes. The Lotus, a fresh flower that is not stained by silt, symbolizes purity, hope, and beauty. She transforms into a unique digital print, seen in cheongsam and short blouses, or embroidered on the inner collar of a silk trench coat. Not to be missed style also uses hexagonal lace, new, high-quality geometric fabrics; in addition, there is also a must-have waist coat this season - silk and cotton stacked. Fresh and gentle colors of spring rain, cream, pink, violet, green and blue, create a peaceful, dreamy and peaceful atmosphere. Inspired by the meaning of washing rain and dust in the spring rain, the ritual sense of cleansing signifies the rebirth of Phoenix. The vitality of the new life is expressed through the lotus's new life, but this is especially delicate. "Lianhua Printing" presents a honeycomb--abstract and organic posture, which also adds new ideas to the Chinese folk traditional tie-dyeing; the edge of the pattern gets more inspiration from the lotus - inspired by ancient blue and white Pottery, and then turned into beautiful embroidered kimono jacket. "Phoenix Feather" is an abstract reading of Chrysanthemum, one of China's most popular flowers.